On 17 June 2012, a Saudi Arabian Blogger Raif Badawi was arrested under the charge of “insulting Islam”. 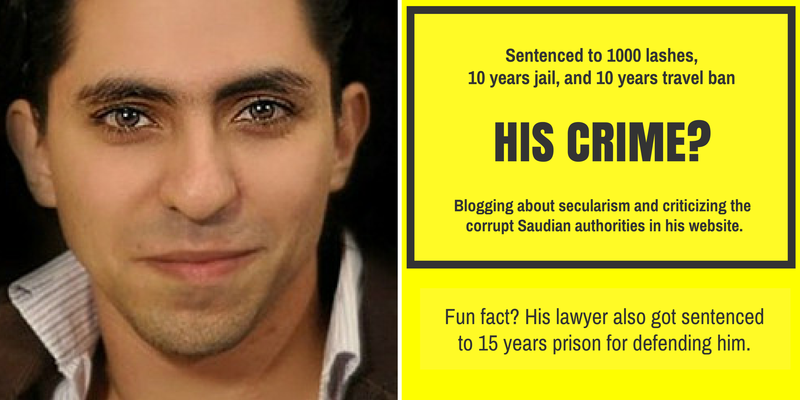 Raif Badawi had created “Free Saudi Liberals”, a website which encouraged debates on religious and political issues in 2008. The website promoted the idea of secularism and criticized religious extremism. He was charged of insulting Islam through this website. The Saudi Supreme Court held him guilty and pronounced a sentence of 10 years in prison, 1000 lashes (50 lashes on every Friday) and a fine of 1 million riyals. After he serves a decade in jail, he is also forbidden to travel for the following decade and from participating in the media. He had been previously charged for “apostasy” in 2008 as well but was released after questioning. “Apostasy” which means renunciation of one’s religion is chargeable with death sentence in Saudi Arabia. In 2012, the prosecutors wanted to charge him under apostasy as well but in 2013, he was cleared for it. According to sources, he may face the charge of apostasy again. Raif Badawi is undergoing the punishment for the charge of “insulting Islam”. He is imprisoned. He had received the first 50 lashes in January. But since his wounds remain unhealed, the punishment has not been repeated. Badawi has support from the international community. He receives support from the United Nations, United States, the European Union, Canada and several other countries. Human Rights Activists and Organisations around the globe have expressed their support with him. In January 2015, the United Nations had issued a last-minute appeal to Saudi Arabia to stop the scheduled second round of flogging for the activist. They had also appealed the Saudi Government to review this type of penalty. However, the Government remains unmoved. While the punishment is being delayed, there is no news of any relief. Infact, the Saudi officials have asked the international community not to “interfere” in the ‘internal’ matters of the country. It applies to all member countries of United Nations. Since Saudi Arabia is a member country, it is applicable for it as well. Going by this, Raif did nothing wrong. He has the right to freely express himself and to have an opinion. As the right mentions, he also had the right to seek information, learn from other sources regardless of the frontiers and this is what he had done. No Government should try to define the boundaries of knowledge. Badawi has the right to think and decide for himself. He has the right to form his own opinion, choose what he may believe in. His website conducted debates on different issues. It cannot be regarded to be illegal and unacceptable. What is unacceptable is the behavior of the Saudi Government to restrict knowledge. Controlling freedom of speech, dissent is a mark of autocratic and barbaric states, not modern nation-states. Badawi has been accused of “insulting Islam” but how has he done so? There are no concrete evidences available to prove that he had “insulted” Islam. There is a difference between insulting and being critical and the latter cannot be regarded to be illegal or objectionable. Everyone has the right to be critical. It is important to understand and know what exactly had Badawi said that is considered to be against Islam. What was objectionable? Was his way of holding a debate over religious practices objectionable? If yes, then this very thinking is against Islam. Islam was born out of questionings, as a response to the contemporary sociopolitical situation. Islam is rational in its essence. Every practice that Prophet Mohammad had ascribed was given with reasons which were clearly specified. This method meant that he wanted that people should know why a certain practice has been prescribed. The underlying motive seems to be to challenge blind acceptance and to promote thinking and rationality. Thus, debates cannot be considered to be un-Islamic. Debates to think about the religious practice, to explore the true essence of islam cannot become unacceptable. A true Muslim who knows about the life and teachings of Prophet Mohammad will know it. Prophet Mohammad laid down several practices and they all responded to the specific conditions at that time. The overarching ideology was to promote peace and justice. Even if Badawi may have challenged some of the practices, he did so by being under the ideological paradigms of Islam. So he could not have “insulted” Islam. He may have been critical which is allowed not only by the Universal Right to Freedom of Opinion but by Islam itself. Through his writings, Badawi had criticized persecution of other religions in Saudi Arabia and the conservatism of Saudi Clerics, their attitude towards secularism. This is not to argue that all his writings were unproblematic but what is true is that his larger ideas were right. There were no false claims. A glance at the Saudi Arab’s human rights record can testify it. More importantly even if his ideas were problematic, his writings were one-sided or biased, the fact is that they were only articles. They were also not provocative. He also did not have the same authority as Saudi clerics did. Unlike them, he could not issue any fatwas to impose his view. The Saudi authorities are trying to charge Badawi for apostasy for which he can be granted death sentence. Badawi would not be the first to be the victim for apostasy. Saudi Arabia has a terrible record of executing people. As reported by Amnesty, Saudi Arabia ranks among the top five executioners in the world. In 2014, 90 people were executed. So far in this year, 54 people have been reportedly executed in the first three months of 2015. (Source: https://www.amnesty.org/en/articles/blogs/2015/04/the-ultimate-punishment-saudi-arabia-ramps-up-beheadings-in-the-kingdom/ ) Apostasy is one of the top charges for execution. Apostasy means the renunciation of one’s faith and conversion to another. Simply put, it is a barbaric practice. Everyone has the right to think and decide for oneself. Secondly, it again cannot be a rule that may have been given by Prophet Mohammad. The rationalist that he was, he would not have forced people to follow his teachings. He wanted people to follow his teachings by understanding them, their importance. Prophet Mohammad was also not opposed to people of other religions. His teachings did mark a deviation from them but he had not permitted the use of violence against them. Killing people over their religious beliefs is un-Islamic and inhuman. More importantly, if one is truly religious, one will know that religion is a sacred thing. All religions teach the same thing. They teach love, justice and humanity. Only a person who is not familiar with his/her religion will fight over it. Religion is not an identity, it is a belief. If someone does not believe in or follow the religious practices, how does it matter if he/she is a follower or not? A last point is that by giving death sentence or lashes as punishment, will the glory of Islam be established? Will people who do not believe or respect Islam start respecting it? There are better and more civil ways to tell people that what they are thinking is wrong. Violence is never the solution. Saudi Arabia has one of the worst human rights’ record. The Saudi Arab authorities severely restrict freedom of expression, impose censorship, have discriminating laws against women and non-muslims, have detained and sentenced without trial, many Government critics and political activists. Badawi had written about this at length. He had particularly criticized the government for suppressing dissent. There is a possibility that Saudi Arabian authorities have suppressed Badawi not for his views held to be against Islam but against itself. The lack of concrete evidence as well as the writings of Badawi hint at it. Badawi’s case, thus, needs to be seen in a more complex way and should be supported by anyone who supports Freedom of Speech, Secularism and understands Islam. While Badawi’s case is not the first case, there is a chance to make it the last one or move towards a better tomorrow. This entry was posted in Democracy, Human Rights, Religion and tagged Freedom of Speech and Expression, Human Rights, Secularism.